Echoes of Apollo was first released at the end of March 2015. The book currently can be purchased from Amazon, just follow the links below. As a science fiction fan and a NASA buff, I thoroughly enjoyed this book. The story was well written and thought-out, the characters developed and relatable. There is some hard science, but not so much that a lay reader would feel lost. As with any science fiction, the reader has to suspend some disbelief. The overall story, however, does come across believable. I could not put it down. I highly recommend this book. — An exciting book, a great story. This novel is a marvelous technothriller in the style of the late Tom Clancy. 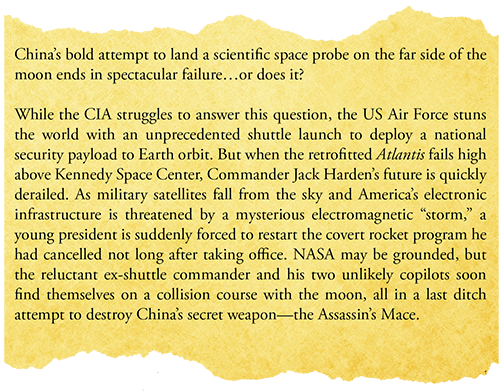 The story is of what amounts to the first space war between the United States and China centered around a mission to the moon using hardware from the very beginning of the space age. The technical details are spot on and the story is exciting and riveting. Echoes of Apollo comes highly recommended for anyone who loves space exploration and tech oriented action. Really well done plot. This book brims with action!! The heroes may seem a bit 1 dimensional but the payoff is in the details. 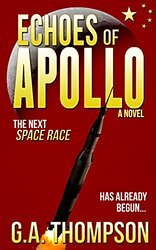 The author takes great pains in using detailed Apollo procedures to tell a great story. Its a well done ride through the glory days of Apollo flight control and hardware. I loved every page! —Excellent story for anyone that loves NASA! Copyright Echoes of Apollo. All rights reserved. GThompson@apollonovel.com • Website powered by Mountaineer I.T.